An annual regional security forum kicked off in Singapore on Thursday, bringing together top diplomats from 26 countries and the European Union for talks on political and security issues in the Asia-Pacific region. Hosted by the Association of Southeast Asian Nations, the meeting gathers foreign ministers from the two Koreas, the US, China, Japan and Russia -- key players in the Korean Peninsula’s denuclearization efforts -- amid growing concerns over little progress toward denuclearization. The 10 ASEAN member countries and other partners are working on a joint communique hailing the recent North Korea-US summit, the North’s commitment to denuclearization and reaffirming full enforcement of sanctions against the reclusive country, according to news reports. Foreign ministers from 26 countries and the EU are to adopt the joint communique at their meeting Saturday. Aside from North Korea, rising extremism, escalating trade tensions between the US and other global powerhouses like China and the EU, territorial dispute over South China Sea and the plight of minority Rohingya Muslims are expected to top the agenda at the four-day forum. 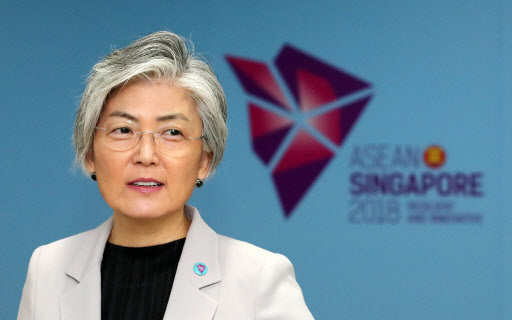 South Korean Foreign Minister Kang Kyung-wha has engaged in bilateral diplomacy to promote the government’s policy to foster ties with the ASEAN bloc and call for support for the ongoing peace efforts. On Wednesday, Kang had bilateral meetings with foreign ministers from six Southeast Asian countries. On Thursday, she separately met with Chinese counterpart Wang Yi, Japanese counterpart Taro Kono and Russian counterpart Sergey Lavrov. She is also to take part in an ASEAN-South Korea foreign ministers’ meeting and a Mekong-South Korea foreign ministers’ meeting Friday, as well as the ASEAN Plus Three and East Asia Summit on Saturday. North Korean Foreign Minister Ri Yong-ho plans to arrive in Singapore on Friday morning. He was spotted at a Beijing airport earlier Thursday, apparently having flown from Pyongyang on an Air Koryo plane. He remained tight-lipped in front of reporters, according to news reports. Ri is reported to be planning to hold bilateral meetings with top diplomats from some six countries. Foreign Ministers from South Korea, China, Japan and Russia are seeking to meet with Ri, but no specific schedule has been confirmed. US Secretary of State Mike Pompeo will arrive in Singapore on Friday. He is scheduled to have a meeting with Kang on Saturday. It remains unknown whether he will have a meeting with Ri on the sidelines. Pompeo is expected to urge tougher enforcement of UN sanctions on North Korea, amid news reports that sanctions against the North are being relaxed and the reclusive country is continuing to build intercontinental ballistic missiles. The regional forum, led by ASEAN and attended by other partner countries such as South Korea, the US, China, Russia and Japan, is one of the largest gatherings in the region to discuss security issues in the Asia-Pacific area. In recent years it has served as a rare venue for North Korea to interact with other countries.